A few pieces here and there of neutral winter still hangs about The Nest. Spring fever is starting really early for me, possibly because it has been a mild winter. 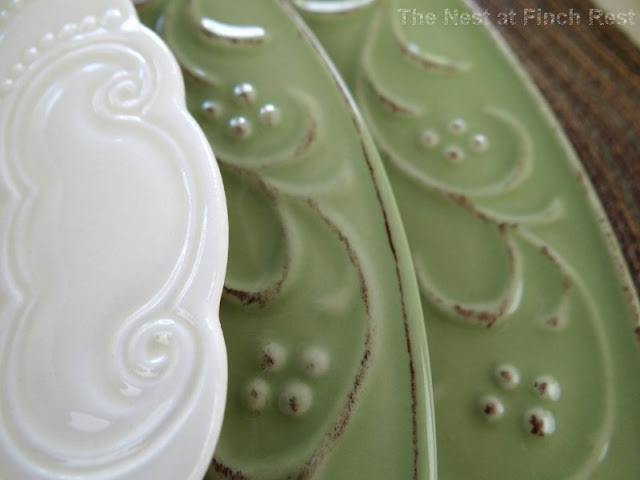 Regardless, I was playing with dishes and came up with a somewhat transitional tablescape. 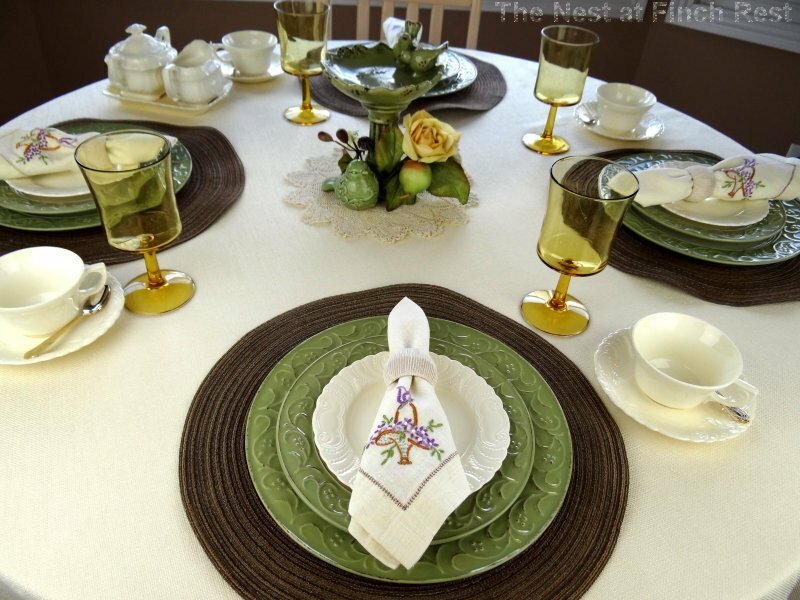 It is spring-like, but I tried to tone it down with deep brown placemats and golden water goblets. It came out Earthy, warm and early Spring-like. Here it is without the brown placemats. I think I like it better, but may be too early for it. What are your thoughts? I am usually a "more layers win me over" kinda gal, but I do like both. I love the way the embossment plays well with one another.....old and new, friends at last. 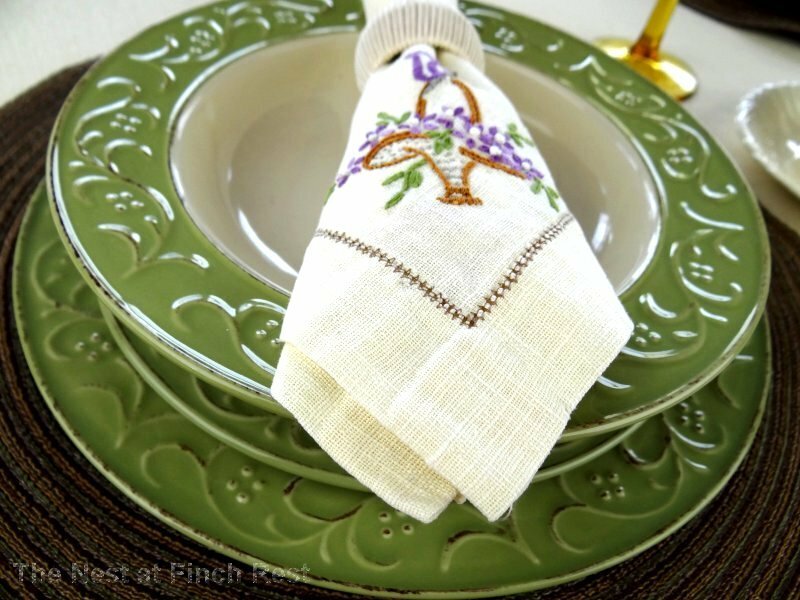 Speaking of old, these lovely vintage embroidered napkins were a gift from a dear friend and true "Southern Lady," Suzette. 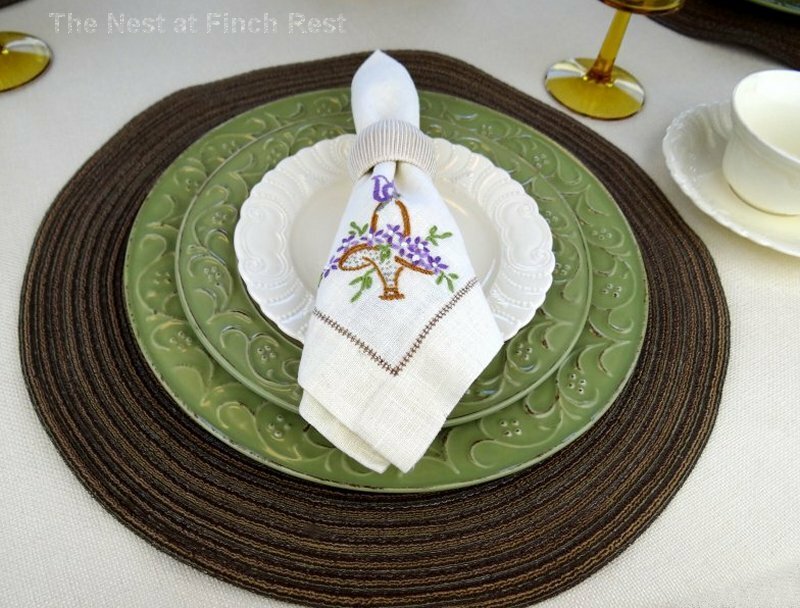 How well the green leaves in the basket of flowers go with these stoneware plates and how well the brown cross trim ties in with the brown of the placemats! The (daily) flatware is wrapped up and hiding inside the napkins. The centerpiece is bird-themed (big surprise there) and sits on my very favorite antique cream lace doilie....making another blend of old-meets-new and new-that-wantstabe-old. 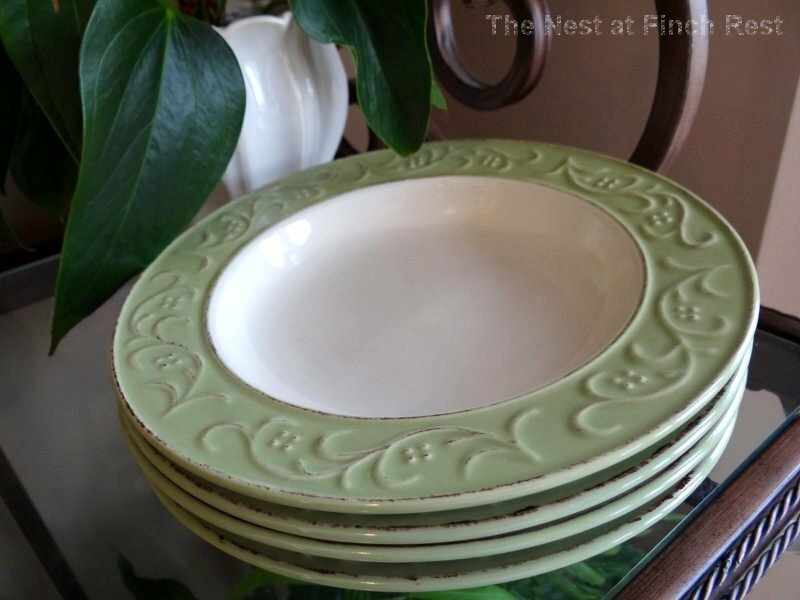 Matching bowls are waiting on the baker's rack nearby - ready to be filled with some hot & yummy comfort! 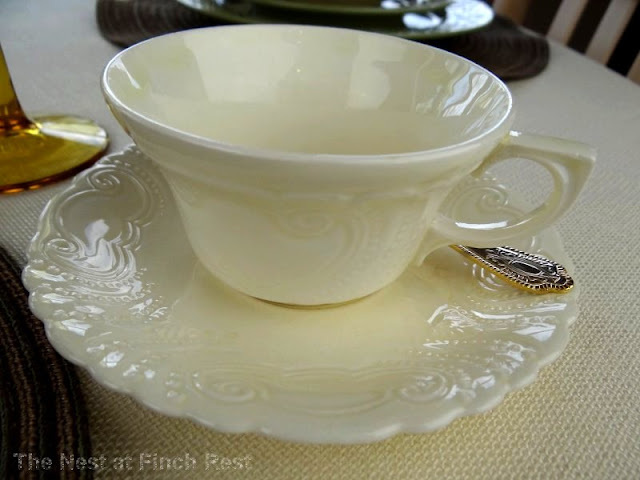 And we can't forget the teacups..............the best part of any tablescape! These creamy lovelies and matching bread plates were an estate sale score and have been waiting to come out and play! 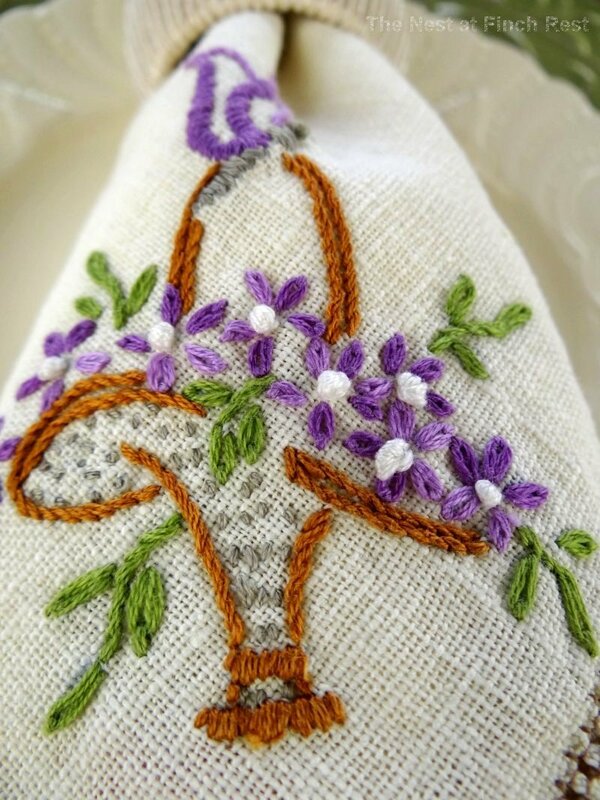 Heading on over to BNOTP for Tablescape Thursday! 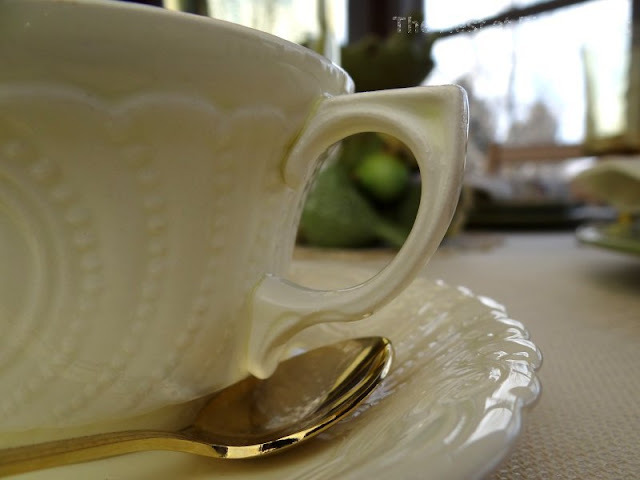 Joining the party at Teacup Thursday! Poppin in to say hello over at 2805 Potpourri Friday! It is so much fun playing with dishes and I really like yours! 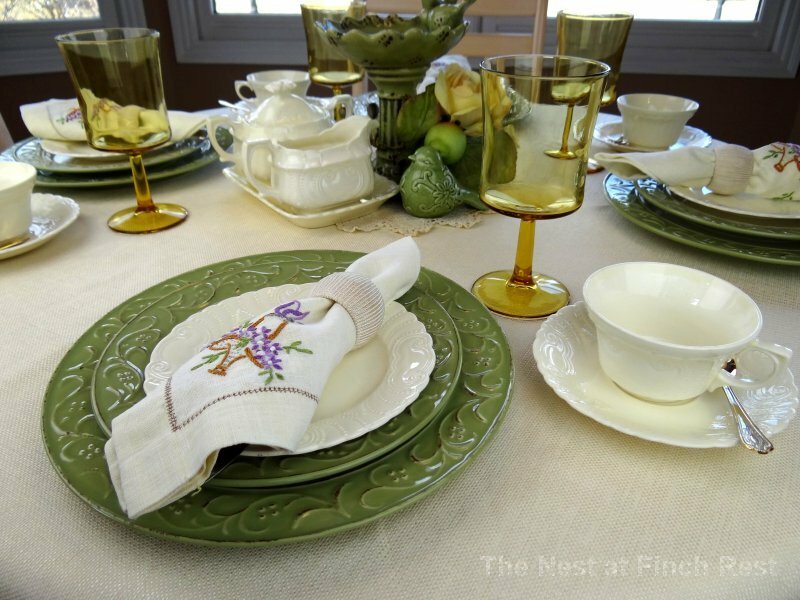 I think your lovely green plates stand out better without the brown placemats. Maybe for a autumn table the brown would be great. Love your white teacups and all your birdies! Yes! Lose the brown! Beautiful table! It looks lovely! I like it both ways, the brown kind of grounds it. I love it with the place mats! The brown brings out the pattern on the plates ... and the color of the basket on the napkin. 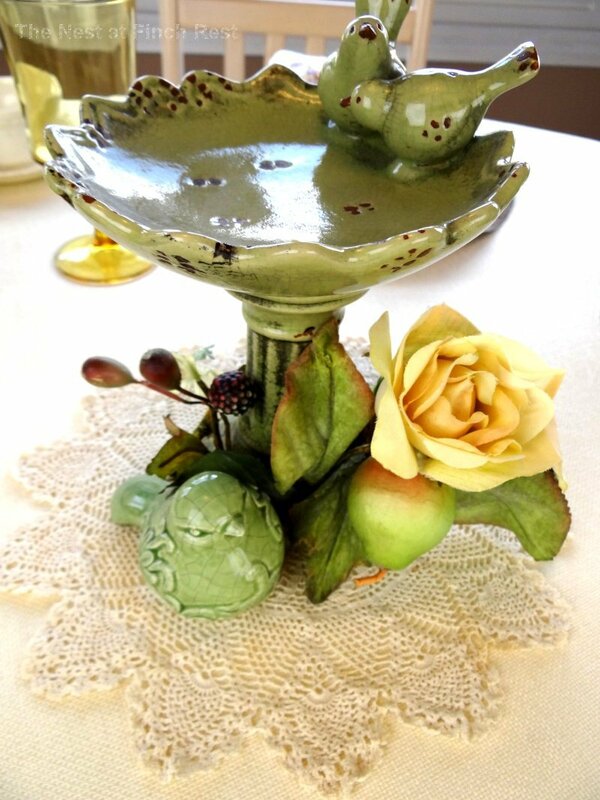 I also love the simplicity of the centerpiece! Thanks so much for sharing. I love your dishes! 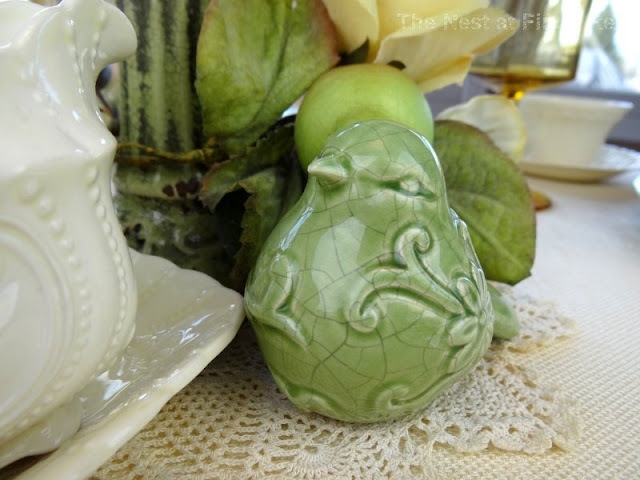 Perfect for an Easter table as well! Great table and I like it without the placemats. Your cups/sauces are really beautiful! 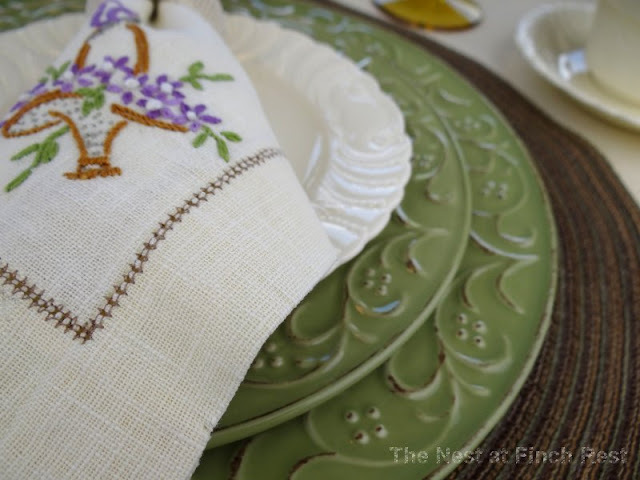 Your table is beautiful and the napkins are really special! Thank you for sharing your creativity at Potpourri Friday! just so pefect! love it!